I take a cue from the concerns of the average American and even institutions – from the press to the institutes – about the possibility of election rigging in one of the world’s oldest democracies. Right after the Trump election, several allegations made it into news about Russian interference with the American poll. Till date, some of the allegations sounds too fantastic but much attention has been brought to the prospects and implications of the distortion of the will and desires of a people, pertaining to their leadership, as expressed in voting cycles. Also, scholars are examining the effect that such distortion have in other areas of society, since people tend to tune off from patriotic deeds, or assume a conspiratorial stance to cheat the system when they see that elections are blatantly rigged. The very system of government called democracy is also under some sort of scrutiny. Is democracy truly the best system among the flawed lot? Now, if organisations like the Brookings Institution could worry about the subject of rigging in the U.S.A we in Nigeria, famous so far for many wrong reasons, do have a major crisis of governance on our hands. We are waiting eagerly to see how the upcoming elections will pan out. The debates were, especially, engagements being looked forward to. Many parties had popped up in recent times, with private-sector people who had kept away from active politics rushing into the political space out of frustration with the quality of ideas (or lack of it) in that realm, as well as palpable disappointment with the elements that Nigeria has trusted over time. It was just in time, because we later saw how easy it was to wake up in one ‘big party’, go for lunch in another ‘big party’ and return to sleep in yet another ‘big party’. Nigeria’s embedded and entrenched politicians seem to be having a great time at the expense of the larger citizenry. It was within this setting that we thought politicians – especially the newer entrants – would be able to get a raft of ideas into the sociopolitical space so that at least – like the parable of the sower – one or two may germinate and bear fruits. Alas, there seems to be a systemic attempt to truncate this potential offering of a bouquet of fresh perspectives, occasioned by desperate and blatant actions by state and non-state players with entrenched interests. With public funds channeled through publicly-owned television stations, organisers of debates have, so early in the race, closed down the political space at a time of great agitation and anxiety, when Nigerians need considerable political release. Instead of allowing Nigerians some catharsis at this moment by way of political expression, we are witnessing a constriction of the political field and a deliberate skewing of what should be a level playing ground. That is why, as against what happened in 2003 when nine parties debated in the presidential and general elections, in 2011 when eight parties debated and in 2015 when ALL political parties were invited for the debates and 11 showed up, this time only five parties were arbitrarily selected for debates (including Nigeria’s two large parties, which have been funded over time by government until they became behemoths and that have access to public funds in an atmosphere of unbridled corruption and zero accountability). 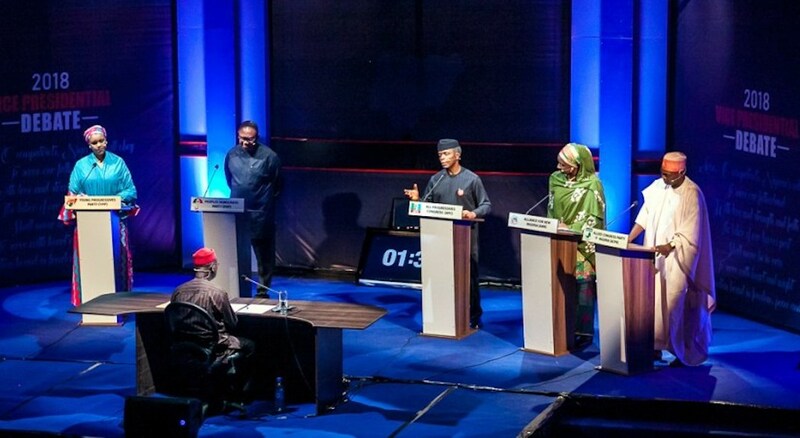 The organisers of the debate felt they couldn’t be bothered to listen to more than five political parties and that Nigerians will have to make do with whatever they offered – on public funds. They therefore fired the first rigging salvo with the acquiescence of the Independent National Electoral Commission (which should have advised them properly), and in contravention of provisions of Nigerian laws on the need for a level playing field for all political parties, by propping up and promoting five parties of their whimsical choice – again, with taxpayers’ money. They ignored the fact that all parties have taxpayers as their members and that all candidates of these parties are elected representatives of their party members, who are taxpayers, as mentioned. The first set of electoral debates were held – for vice presidential candidates of five privately-selected political parties – on a day the president finally confessed that the economy had tanked and we should all ‘tighten our belts’ because things will get worse! I believe that this will haunt and has already marred the upcoming elections. Nigerians are saying that the process of pre-selecting five out of 91 political parties for the debates amounts to an ‘election before the election’. And they are right. The organisers, the Nigeria Election Debate Group (NEDG) and the Broadcasting Organisations of Nigeria (BON) claim to have the most extensive network and reach into every Nigerian home. More than 400 broadcasting organisations (many of them owned by Federal and State governments) are members of the BON/NEDG. None of the other candidates can afford access to the platform which the government and party in power has gifted itself and a few selected parties. To that extent, the BON/BEDG group has indicted itself. Nigeria’s ‘most-respected’ and perennial award-winning TV station, Channels TV, is also a prime mover of the project, with its chairman also doubling as the chairman of BON and NEDG, in what observers have called a major corporate governance miscue, and a clear case of conflict of interest. Since the Nigeria Television Authority (NTA), which is owned by the Federal Government of Nigeria and funded by taxpayers, is also a prominent member of BON/NEDG, a number of new entrants in the presidential race were summarily frozen out of the prime-time debates and confined militarily to the status of viewers in a return to Nigeria’s jackboot era. Many Nigerians find themselves once again complaining from the safety of their homes, afraid of consequences, should they speak out. …ALL parties have the same status under our constitution….It is a grievous error to treat one as more superior than another. It is the stuff that caste systems are made of, and that is unacceptable in this age and time. It is the stuff that apartheid is made of; and classism; and racism; and superiority complexes – personal, tribal or religious; and injustice, corruption and nepotism. The world talks of rights for the infirm, youth, women, minorities and the vulnerable. This should be naturally carried into politics. Inclusivity is absolutely important and is a more sophisticated ideal than mere efficiency for one single reason – over time some entities, groups, races, genders and persons have obtained advantages and secured positions that guarantee those advantages and leads to such being inherited by their offsprings for generations. They needn’t secure those positions in perpetuity. Others should be given a chance at the positions. Allowing others to also seek these brings fresh ideas on the table, otherwise an entity, institution or nation will be stuck in a time warp with the ideas of the ‘strongest’ people or those who have secured positions over time, digging in, permeating the space and determining the future of such organisation, entity or nation. This weakens an institution or nation, in comparison to others. Dynamism and inclusivity is therefore an absolutely important advantage to those who can secure these. It is no wonder that Nigeria is at this point today – socially and economically. Our president found it hard to understand the meaning of inclusivity at his first meeting at the U.S. Institute of Peace in 2015. By the time he appointed his cabinet in 2015/2016, we found a scenario where old, traditional men with stale ideas and life views roughly elbowed out women and youth, and reduced the representation of those demographics in governance. Yet for Nigeria, it is a grave mistake for us to wittingly or unwittingly solidify the advantages of the same people and parties that got us to this stage. Newer, more modern and workable ideas are more likely to come on board if we allow other parties to express themselves. Also as political entities, ALL parties have the same status under our constitution. A human being is a human being. It is a grievous error to treat one as more superior than another. It is the stuff that caste systems are made of, and that is unacceptable in this age and time. It is the stuff that apartheid is made of; and classism; and racism; and superiority complexes – personal, tribal or religious; and injustice, corruption and nepotism. It was indeed a sad day for Nigeria when the debate group gave effect to its illegality and impunity, defied the public’s outcry and demonstrations, and held the vice presidential debate, promoting five parties at the expense of at least 70. The injustice must be redressed and a number of neglected candidates promise to be in court in a matter of days, seeking damages, or a stoppage of the 2019 elections. Also, precedence is a great pointer. Just as the Americans started out with voting rights, first for only barons and landowners, then included smaller landowners, then every white man, then women, then freed black slaves and finally ALL human beings, the political space MUST always expand if a country is not to collapse. Why were all parties invited to debate in 2015 and 11 actually went and the debates were held in two batches, which added value to the space and gave us all a sense of progress? Why would the proportion of debating parties be reduced to the lowest in our political experiment, in the age of knowledge and intelligence, when our youth are longing for engagement? 1. Tilting the playing field by using media exposure for a few parties at public expense – this is a very powerful tool being used in 2018. This is like rearranging the ballot paper and positioning the ‘favoured’ parties where they can be more easily found in the eyes and minds of the people. This is contrary to sections of our federal Constitution and Electoral Act which guarantee no discrimination, in terms of media time, to ALL political parties. 2. The deployment of media as in (1) above is a subtle way of contributing campaign finance to ‘favoured’ parties and since there is much opacity in the affairs of the organisers, there may as well have occurred a breach of campaign finance laws. 3. Ballot snatching and fomenting of violence to scare away ordinary, non-violent voters. 4. Vote buying – wherein money is deployed before, during and after elections to influence already impoverished voters. This is contrary to Sections 120-126 of the Electoral Act, as amended. 6. Mass thumbing of ballot papers, which are then somehow used to fill boxes and counted as genuine votes. 7. Situation of polling booths in the homes of warlords, tribal and political kingpins and other such ‘secure’ places, where the will of the sponsor will prevail. 8. Switching of figures upon transfer of results from polling to collating centres, or from collation centres to states and federal consolidation centres. 9. The simple writing of results. 10. Others… Fill in the space yourself. It is more than obvious that those who enjoy Nigeria’s status quo are willing to hold on to power this time with everything they can muster. Some of us who are on the other side of the divide are also ready to call global attention to the travesty. At least we want to be on record that we saw this early…. And warned about it early too.